A light dinner that’s centered around protein and veggies is the perfect way to end your day. Today I have an innovative recipe that delivers big in both flavor and fitness. 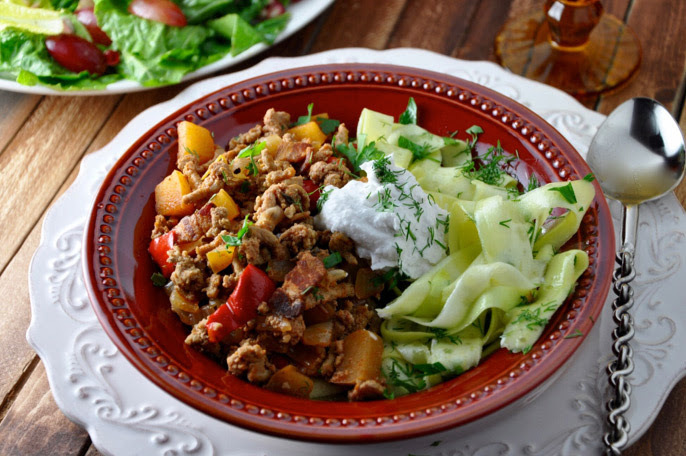 This Fit Turkey Goulash is a fun way to serve up wholesome ingredients that the whole family will enjoy. Making smart substitutions, like using zucchini noodles instead of traditional pasta noodles, is a great way to eat meals that help propel you towards your fitness goal. Lucky for you this wholesome meal is packed with flavor! 1. Place a Dutch oven over medium-high heat. Add the bacon and cook until crispy. Transfer the bacon to a plate with a slotted spoon. 2. Add the ground pork to the pot in the bacon drippings, cook, breaking it into smaller pieces. Season with salt and pepper. 3. Add the apples, onions, bell pepper, thyme and bay leaf. Cook until the onions soften, about 5 minutes. Mix in the paprika and cumin. 4. Return the bacon back to the pot, along with the lemon juice and broth. Bring to a boil, reduce the heat to a simmer, and cook until the goulash thickens. 5. Use a veggie peeler to peel the zucchini into flat noodles in a large bowl. Toss with the olive oil and season with sea salt. Mix in the parsley and dill. 6. Serve the goulash warm over zucchini noodles with a dollop of Greek yogurt. Enjoy! One serving equals: 360 calories, 18g fat, 19g carbohydrate, 5g fiber, and 37g protein.